George Vaillant, backed by more than 60 years of files from the Grant Study. They are the men who, born in the Roaring Twenties and schooled during the Depression, fought and won World War II, who returned to father the baby-boom generation and enjoy years of postwar prosperity in the last open-field run of the white American male. In his 1998 book, NBC Nightly News anchor Tom Brokaw called them The Greatest Generation; 50 years earlier, Norman Mailer '43 had brought their World War II experiences alive with The Naked and the Dead. When John F. Kennedy '40, LL.D. '56, moved into the White House, his peers were coming to power throughout America, and his administration drew generously from their ranks; The Best and the Brightest, by David Halberstam '55, showed how some of them led the country into the Vietnam War. A few years later, Washington Post editor Benjamin Bradlee '43 supervised the Watergate coverage that helped bring down a president. This generation has unquestionably made its mark on history. But what mark has time--and life history--made on them? How have they changed, grown, and faltered over six decades as adults? How have they fared personally--in what ways have they triumphed or failed in their human relationships, physical health, and psychological maturation? Aging Well, by George E. Vaillant '55, M.D. '59, which Little, Brown will publish this fall, looks at these questions through a Crimson lens. The book examines the lives of a group of Harvard men who have been studied from their college years all the way to retirement and, in some cases, death. Its cornerstone is the Grant Study, a longitudinal investigation conceived in 1937 and launched at Harvard in 1939. With funding from dime-store magnate W. T. Grant, researchers signed up 268 members of the classes of 1941 through 1944, in their sophomore years, for an in-depth, lifelong study of "normal" adult development. 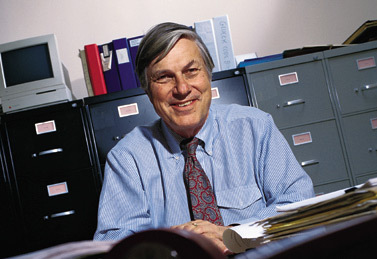 Grant believed that psychologists had focused so exclusively on mental illness that there was little knowledge of mental health--hence, the project chose boys recognized by deans as "sound," those able, in the words of the then Oliver professor of hygiene Arlie Bock, M.D., "to paddle their own canoe." Almost all the subjects stayed in the study, and the survivors are mostly octogenarians. Their life histories open a remarkable window onto the process of human maturation in its physical, psychological, and social aspects. It turns out that the pathways that lead to physical health and joyful living in later years are actually quite distinct from each other--but, as Vaillant observes, "we need both to age successfully." Such knowledge is now in great demand. In 1910, only 1 percent of living Harvard alumni were retired. Today, 15 percent are. There is more "life after work" than ever before--but how to use this time well? Vaillant, who has spent much of his own career on the Medical School faculty, can suggest some answers. He joined the Grant Study in 1967 and interviewed many of its subjects when they returned to Cambridge for their twenty-fifth class reunions. His 1977 book, Adaptation to Life, depicted the men at midlife and analyzed their personalities in terms of a hierarchy of defense mechanisms--characteristic ways of handling emotional conflict and stress--that ranged from low-level, immature defenses like blatant denial and passive aggression to mature adaptations such as altruism, humor, and the sublimation of energies into art. Now, in Aging Well, he writes that "...it is social aptitude, not intellectual brilliance or parental social class, that leads to successful aging." Furthermore, the habitual use of these mature coping styles--ways of "making a lemon into lemonade," in his words--is, in psychological and social terms, the most powerful predictor of successful aging. Though the research continues and will generate future publications, the forthcoming book is a kind of final report on the Grant Study. It brings in data from two other venerable longitudinal studies, one of inner-city men in Boston, one of California women selected for exceptionally high intelligence. (The three projects comprise the Study of Adult Development, which Vaillant directs, based at Harvard Medical School.) Aging Well asks what makes for successful maturation--what are the factors that separate, in Vaillant's words, the "happy-well" from the "sad-sick" in later life? Six factors measured by age 50 were excellent predictors of those who would be in the "happy-well" group--the top quartile of the Harvard men--at age 80: a stable marriage, a mature adaptive style, no smoking, little use of alcohol, regular exercise, and maintenance of normal weight. At age 50, 106 of the men had five or six of these factors going for them, and at 80, half of this group were among the happy-well. Only eight fell into the "sad-sick" category, the bottom quarter of life outcomes. In contrast, of 66 men who had only one to three factors at age 50, not a single one was rated happy-well at 80. In addition, men with three or fewer factors, though still in good physical health at 50, were three times as likely to be dead 30 years later as those with four or more. To age well physically, the single most important choice was to avoid heavy smoking before age 50, or to quit at a young age. However, alcohol abuse, which Vaillant has also studied extensively (see "Deep Cravings," March-April 2000, page 60), is an especially pernicious influence that not only damages the body but, as he says, "takes you in precisely the opposite direction from maturity. Alcohol is a cause, rather than a result, of life's problems. Very few bad marriages [in the study] led to alcoholism, but in many cases a man developed an alcohol problem and had his marriage fall apart." The data on "social supports"--the quality and strength of relationships, including marriage, family, friends, and community involvements--indicated that "...the etiology of social supports and physical health are often quite different," Vaillant writes. "Only alcohol abuse destroys both health and happiness." Mental and physical health are about as closely correlated with each other as height and weight: "The things that cause height and the things that cause weight are enormously similar--and enormously different," says Vaillant. While the last 20 years of scientific research have enhanced his respect for the role of genetics, watching adults develop over a lifetime has diminished it. "We're all mongrels," he explains. "Genes are so--well, so heterogeneous. With the passage of time, successful aging is remarkably free of genetic factors." For example, "good genes" do not account well for the generally superior health of the Harvard sample, whose mortality by age 65 was half that expected of white males in their birth cohort. In fact, their death rate was only two-thirds that of their Harvard College cohorts. These men are affluent--at age 47, their average income was $90,000 in 1989 dollars--but Vaillant says that being able to afford better doctors, hospitals, and healthcare is unrelated to their health or longevity. "It's not economic at all," he asserts. "People who go to hospitals are sicker than people who don't. Having better doctors and hospitals is a bit like locking the barn after the horse is out. The trick is not going to hospitals in the first place." A more important factor may be higher education, which seems to improve self-care in ways not well understood. The inner-city men, for example, who were far less educated than the Grant Study sample, were also drastically more obese, and their physical health at the age of 65 resembled that of the Grant Study men at 75. Yet, "being old, healthy, and without friends is no fun," writes Vaillant. Socially isolated men died at younger ages. A mature coping style strengthens relationships because being able to handle emotional issues gracefully removes barriers between people. Advancing age impairs some motor skills, but maturation can make people sharper at emotional tasks. "What test could you have given these men at age 30 that would predict significantly improved life outcomes in their later years?" asks Vaillant. Borrowing a phrase from author Daniel Goleman, Ph.D. '74, he answers his own question: "It would be a test of 'emotional intelligence'" (see "The Emotional Path to Success," September-October 1998, page 60). This talent for human connection doesn't mean being a "people person," an extrovert, or "a salesman who belongs to six country clubs and has a Christmas-card list 200 names long," Vaillant says. Even having people who love you is not particularly important--although, like having money, it does make things easier. Nor is it about caring for others. "Marilyn Monroe made Arthur Miller and JFK feel cared for, but none of it got inside her; lots of healthcare professionals have screwed-up lives, though they are able to care for others," Vaillant explains. "What's critical is allowing yourself to love others, and being able to take people in--as in, 'I've got you under my skin.' When someone gives you a compliment, do you cross the street, or do you feel genuinely good about yourself? In a personal encounter, do you come away feeling resentment or gratitude? A simple lesson from the Grant Study is to worry less about cholesterol and more about gratitude and forgiveness." Some men did this deftly as they grew older. "With the passage of time and the exposure to experience, an erosion of superior layers of the personality can take place. Parts of your life are exposed that were hidden from you, which you had no avenue to appreciate," Vaillant says. In Aging Well, he writes: "[W]hen we are old, our lives become the sum of all whom we have loved. It is important not to waste anyone. One task of living out the last half of life is excavating and recovering all of those whom we loved in the first half. Thus, the recovery of lost loves becomes an important way in which the past affects the present." In the best case, according to Vaillant, an ever-widening social radius allows many older people to become part of all that they have known. In 1999 there was a party at Loeb House in Harvard Yard for the Boston inner-city men, to celebrate the sixtieth anniversary of the project. One of the men laughingly asked Vaillant if their group looked much like a Harvard fiftieth-reunion class. "The answer was yes!" he says. "And this despite 30 points' difference in IQ, eight years' difference in education, and light-years of difference in family of origin. Sure, there were a few men who looked a little out of place, and nobody there looked like Leverett Saltonstall. But I saw plenty of Glen-plaid suits. In both groups, of course, the more successful people tend to come back for reunions. In many ways, over time, Harvard men become more human." The later years also uncork surprises. Though trained as a psychoanalyst, Vaillant bluntly declares that "Freud vastly overestimated the importance of childhood." Indeed, the personality is not fully formed by age 5, nor even by 45. True, most of the men with good outcomes at midlife continued to thrive and enjoy a vital old age. The few all-around successes who fell apart almost always did so as a result of disease. Yet many men who looked unimpressive at 46 had lives that became startlingly better. This seems to be a consequence of continuing maturation--and of avoiding accidents. There may be a few steps one can take to improve the odds. The main task is to create favorable conditions for those mature coping styles that seem to unlock so many treasures of a rich old age. First, says Vaillant, "Our defenses are always more mature when we are not hungry, angry, lonely, tired, or drunk. Feeling safe, secure, and 'held' allows us to use more mature defenses." Second, although it is not easy to change our defenses by ourselves, chance favors a prepared mind: "We can start by admiring how other skillful people cope. Then ponder, when things go badly for us, how we might have used self-defeating mechanisms." Lastly, he says, consider this rule of thumb: "Don't try to think less of yourself, but try to think of yourself less."